This house, the second designed by one of Melbourne’s best-loved architects and architectural polemicists for his own family, was planned as a narrow rectangle with a catenary roof of planking on wire cables. The draped roof is the guiding idea of the house, with much of its accommodation placed as floating timber platforms under the shelter of this single sweeping gesture. The catenary spans the length of the house, describing a volume which contains a central court, a living and parent’s zone at one end and children’s accommodation at the other. 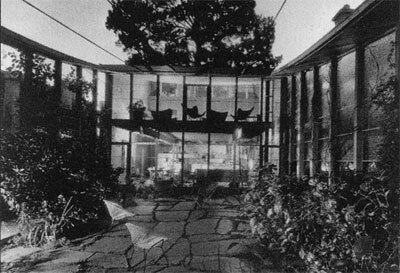 The horizontal break-up of the window mullions, the refined built-in furniture and the obscured glass side walls of the court are evidence of an interest in Japanese design.